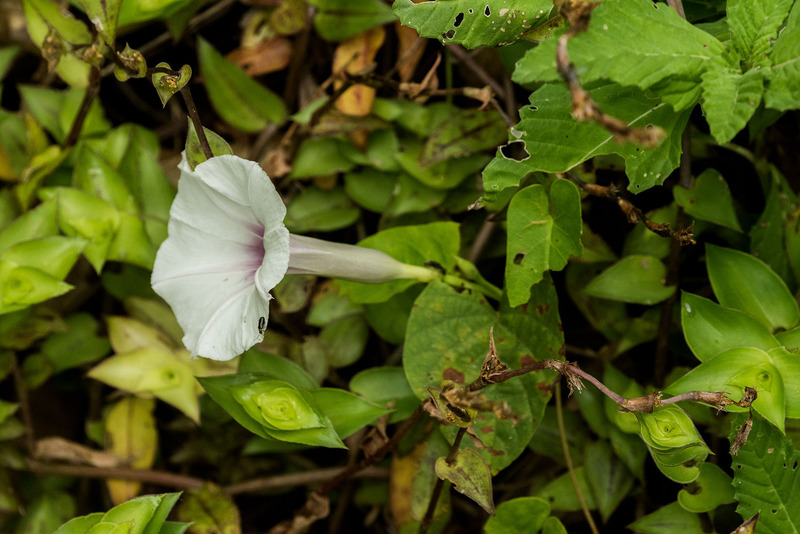 In addition to Ipomoea alba, Merremia tuberosa, and Merremia umbellata, we are photographing every single species of the morning glory family Convolvulaceae that we find in Parque Nacional Yaxha Nakum Naranjo, Peten, Guatemala. 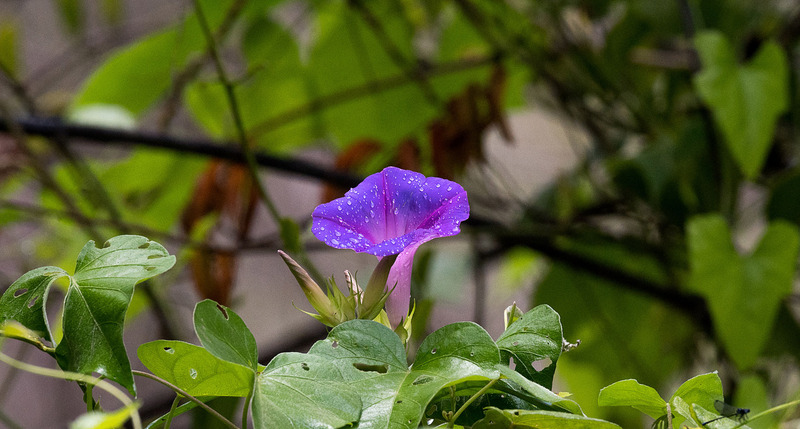 There are lots of morning glories visible when you take a boat trip around the lake and around the islands and then into Rio Ixtinto. We have taken enough photographs that we will have three volumes on all these: Vol. I: Ipomoea alba; Vol. II: Merremia tuberosa, and Merremia umbellata, Vol. 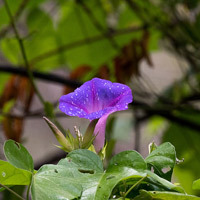 III: all other morning glory vine flowers. Aniseia martinicensis is one genus we discovered in late March 2019. 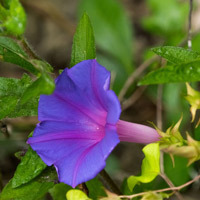 There are several common purple and lavender morning glory flowers that we will identify and include in the Volume III. 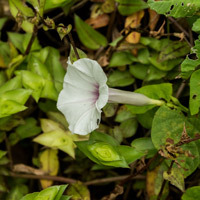 The morning glory popular with Aztec priests and royalty has not been found at the Yaxha park. That is not a research goal but needs to be noted as whether present or absent. No hallucinogenic mushroom is known for Central Peten either: Dr Lowry visited Yaxha when we were there in the 1970’s. We study mushrooms solely for learning which are edible and which produce dye colorant for clothing, paper, and other products. 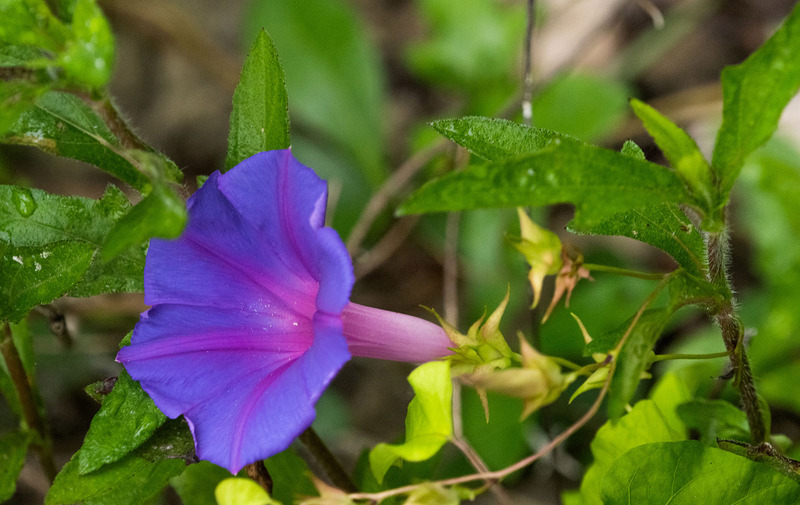 We study morning glory plants to learn which can coagulate latex from Castilla elastica rubber tree and which morning glory plants have other useful aspects. 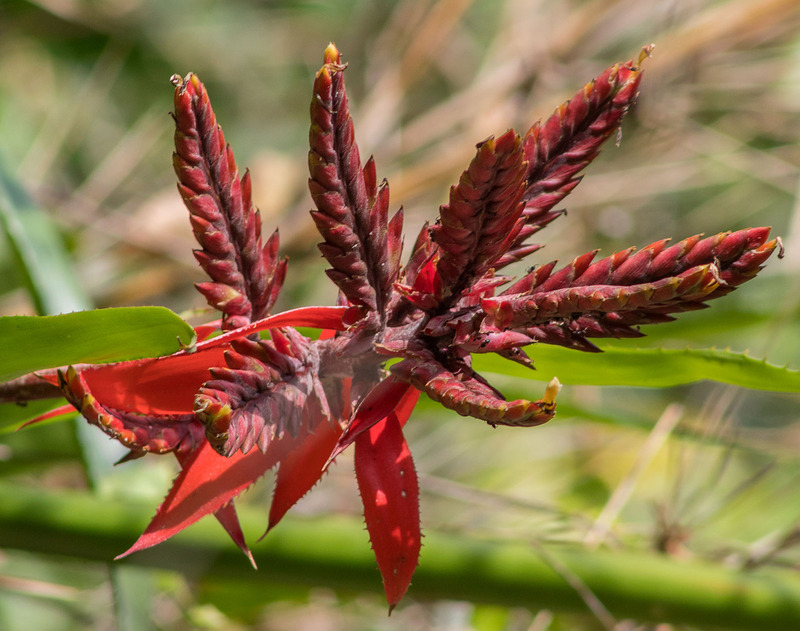 Aechmea tessmanii is not listed as occurring in Belize (Balick, Nee, and Atha 2000: 174). Not listed for Peten (Lundell 1937: index for Aechmea, page 223). Surprisingly there is not one single Aechmea species in Cook 2016 on Lacandon Ethnobotany. The only synonym is Platyaechmea tessmannii, and that is nowhere listed for Peten or Chiapas or Belize that we have yet found (both names will be somewhere, but the main botanical textbooks doe not include Aechmea tessmanii for Peten. 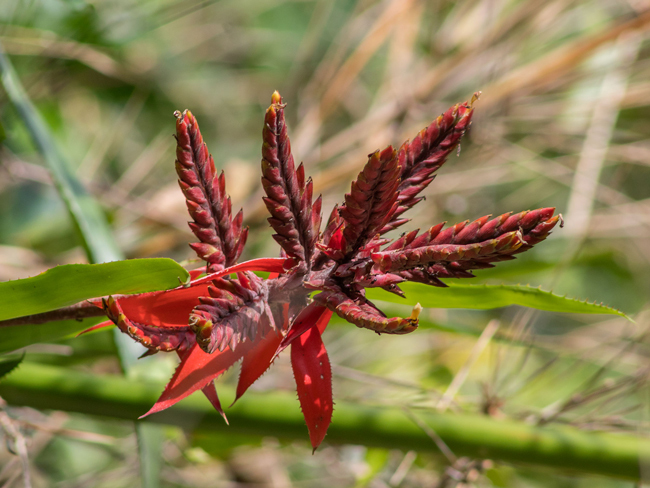 Yet we have found at least two Aechmea at Yaxha area of the park and one in the Nakum area that look very similar. But, Wikipedia says: “This species is native to Ecuador, Peru, and Colombia.” So I kept looking and now estimate that these bromeliads are Aechmea tillandsioides. Of the family Bromeliaceae we have found lots of Aechmea bracteata; park ranger at Yaxha, Topoxte, and Nakum. Teco showed us two areas filled with Aechmea magdalenae between Yaxha and Nakum and the combined team (IDAEH + CONAP + FLAAR Mesoamerica found another pital of Aechmea magdalenae between El Tigre (Mayan ruins) and the northwestern border of the park. We have located twoz or three other large species of bromeliads; some of which can be either arboreal or terrestrial; some which are almost always found growing out of the gound. Plus there are dozens of smaller bromeliads up in the trees. Canon EOS Rebel T6, lens EF75-300mm f/4-5.6; settings: f10, speed 1/160, ISO 100. Photo by Maria Alejandra Gutierrez, FLAAR team. The large savanna found by Hellmuth on aerial photographs has turned out to be a veritable unexpectedly biodiverse area. We have now visited this savanna two times and Elena Siekavizza has a list of about 80% of the trees that grow in the multiple micro ecosystems within this savanna. The savanna is so large we need to return for one more note-taking day (keeping in mind it is a 6-hour round trip hike from the Nakum camp). But the awesome natural beauty, the presence every hundred meters of another micro ecosystem, and the fact that NONE of this specific savanna has been documented by botanists or ecologists (that we know of) previously, fuels our hiking there plus multiple kilometers going from plant to plant in each different ecosystem within the overall savanna. Yes, a savanna is a grassland, but it does have trees, a few full size (Crescentia cujete and Acoelorrhaphe wrightii). However most other trees are stunted, either because of the permanent water in the bog under the savanna surface and/or because local hunters tend to set fire to the grass every year. Canon EOS-1D X Mark II, lens Canon EF 24-105mm f/4.0 L IS USM; settings: f/10, speed 1/30, ISO 400. Photo by Maria Alejandra Gutierrez, FLAAR team. 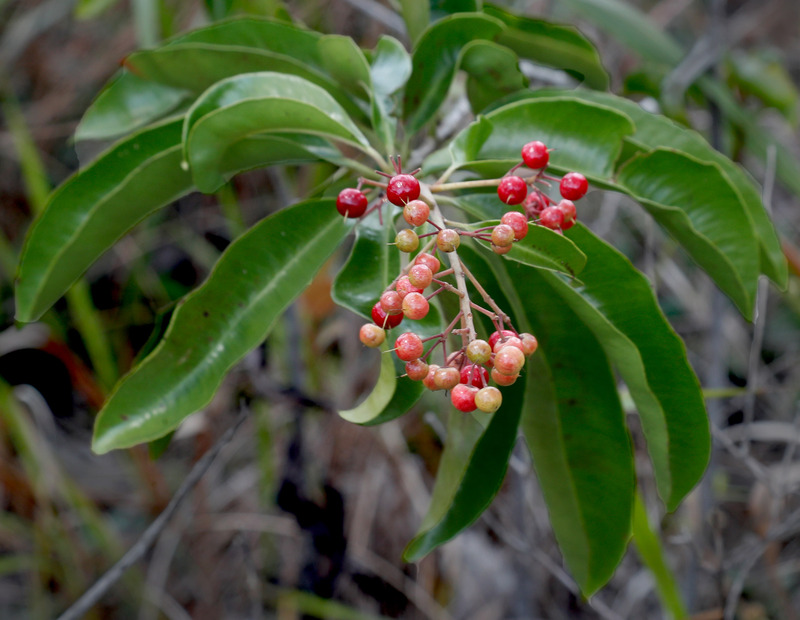 Ximenia americana is known as pepenance (pepe nance) This is because its red fruits (when they ripen and turn orange) remind you of (orange) nance fruits (stunted nance trees are a hallmark of savannas in Peten and adjacent Belize). But Ximenia americana is in the plant family Olaceae, so not a relative of nance from a botanical point of view. Other local names in Peten include Saaxnic and tocote de monte (Lundell 1937: 120) plus abalche, jocote, and jocote montaña. Local names in Belize include sour plum, Wild plum, or wild lime (Balick, Nee, Atha 2000: 104), who list the fruit as edible. Lundell also says the fruits are edible (1937: 59). 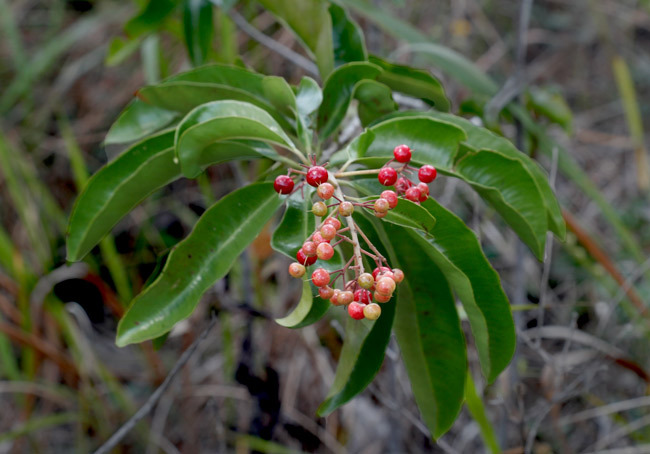 Lundell lists Ximenia americana on pages 45, 59, 96, 118, 120, 135, 137 and 167 (so I am surprised that Schulze and Whitacre do not have it anywhere in their 1999 list of Trees of Tikal). Cook does not list it in her helpful coverage of ethnobotany of the Lacandon Maya of Chiapas. But surely Ximenia americana will be found at Tikal, but in the meantime, if you are interested in plants of Mesoamerica, the Parque Nacional Yaxha Nakum Naranjo is a great place to visit. Camera NIKON D810, lens Nikon AF-Micro-NIKKOR 200mm f/4D IF-ED Macro; settings: f/13, speed 1/250, ISO 1250. Ciricote, Cordia dodecandra, is a tree found in many areas of Peten and elsewhere in Guatemala (and Mexico, Belize, Honduras, etc.). I have been familiar with ciricote for many decades since its flowers are very photogenic. It blooms in March and April (and other months depending on the climate that particular year). I call the tree ciricote; gringo botanists tend to spell it siricote; lumber companies spell it ziricote. The species I know best in Guatemala is Cordia dodecandra but many more species exist in Mesoamerica. In Parque Nacional Yaxha Nakum Naranjo we have found ciricote along the Rio Ixtinto, along the road between Yaxha and Nakum, and next to the camp buildings at Nakum. The Naranjo area should also have plenty of ciricote trees also. The last week of March (2019) I noticed several ciricote trees while hiking through the park. We will be creating a web page shortly, dedicated to documenting all the uses of different parts of the Cordia dodecandra tree. The Cordia dodecandra tree has the added benefit that if you plant it as a future lumber tree you have fresh fruit every year as the ciricote tree grows. We (FLAAR) know of many properties in Peten where a tree nursery could be started and properties which could be reforested. The nice aspect is this part of Mesoamerica is an original home for the Cordia dodecandra tree, so it is already happy with the climate and soils here. 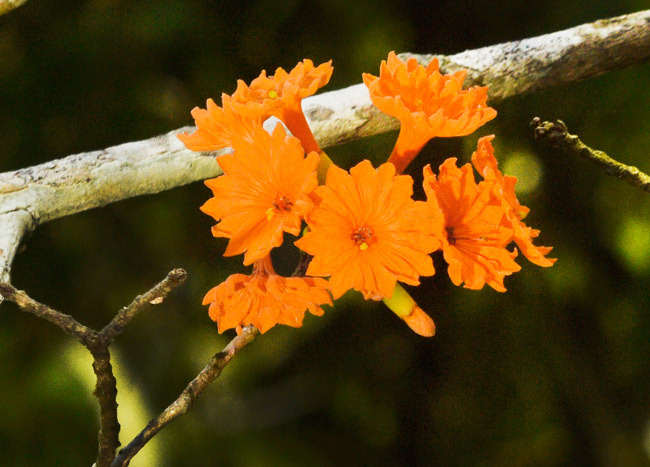 Since we found several ciricote trees in full bloom during late March every day while in Parque Nacional Yaxha Nakum Naranjo, we would like to show the pretty flowers. At Parque Nacional Yaxha Nakum Naranjo the combined team of FLAAR Mesoamerica working with the park administrators through IDAEH and CONAP have found more than a dozen species of mushrooms native to this park. No previous botanical study of this park listed many (or sometimes any) mushrooms (or lichens or moss and not many ferns either). While doing research on pre-Columbian colorants of the Aztecs and other cultures of Mexico, I was surprised to find that all three major books on dye colorants of Mexico clearly document that Aztecs (and assumedly their neighbors) used lichen to make colorants. WOW, sure never knew this while doing research on useful plants of Mayan ecosystems for many decades (keeping in mind that a mushroom is “not a plant” and that a lichen is an algae plus fungus interacting in a mutualistic relationship). Plus not a peep about mushrooms and lichens as dye colorant source in my own decades of research on dye available to the Maya. So now our full-color PowerPoint presentation gathers together all this information (together with high-resolution photos of the mushrooms and lichen at Yaxha) and also mention every vine, plant, tree, etc. that was available to the Mayan people for dye colorants from local Petén resources. The lecture was 2 April 2019, 10 am (to 11 am), Museo Ixchel on campus of Universidad Francisco Marroquín, Guatemala City, Central America. We are now updating this presentation to create an English edition. The co-author of this presentation, Elena Siekavizza, did research and found 48 mushrooms (that grow in Petén area) that can give dye colorants (usually need a mordant also). So as soon as the rainy season returns we would like to find as many of these mushrooms as possible at Parque Nacional Yaxha Nakum Naranjo. But during the last 8 months of field work at the park we have found at least an initial dozen of dye producing mushrooms. Ironically the most common mushroom in the park is a dye source. Lichens are amazing biological organisms, I would be very pleasantly surprised to find any book on Mayan archaeology, Mayan way of life, or any general coverage of the Classic Maya that focused on the potential for using local lichens (yet books on dye colorants by Mexican scholars list and show photos of lichens in all of the three major books on dye colorants). Not one single book on dye colorants of the Maya (that I have on my desk) mention, list, or even hint at mushrooms or lichens. 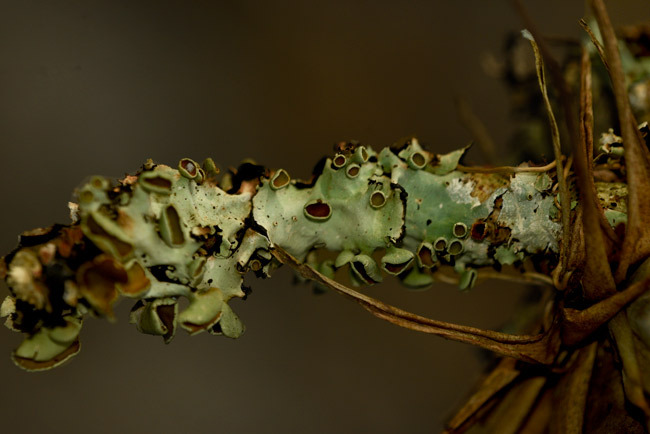 Yet the FLAAR team found lichens in the bajos and rain forests and Elena Siekavizza, did research and found 20 lichen species reported for Peten. Would be great for a PhD candidate to do field work in the Yaxha park to achieve a dissertation on Lichen as a source of Dye Colorants for the Maya. Plus we (IDAEH + CONAP team together with FLAAR Mesoamerica team) have found 9 trees at Yaxha which would have produced dye colorants for the Classic Maya. Seven trees which produce dye colorant at Yaxha are totally missing from books on dye colorants of the Maya of Guatemala (because 99% of research on dye colorants is in the Highlands, especially Lake Atitlan, Quetzaltenango, Huehuetenango, and Antigua Guatemala (plus Highland Chiapas). This is why the FLAAR teams are focusing on discovering dye colorants available at Tikal, Uaxactun, Yaxha, Nakum, Naranjo and thus of course at Holmul, El Zotz, Seibal and all the sites to the west in Chiapas and to the east in Belize. We are working to “rewrite what the Classic Maya had available in their diverse ecosystems for thousands of years.” Plus of course they had trade networks. If your museum, university, botanical garden, foundation, organization, social club, or other entity would like the fresh full-color results of the work of the team of FLAAR and FLAAR Mesoamerica we have lots of lectures with high-definition photographs. For example, the ancient Mayan people had no plastic! Senaida Ba and Nicholas Hellmuth have worked together for several years to make a list, then to find and photograph, all the materials the Mayan had (since there was no plastic). Contact: FrontDesk symbol FLAAR.org (we assume you can figure this out). We can lecture in English, Spanish, and German (and elsewhere the English presentation can be sent in advance to be translated for simultaneous translation during the presentation). Ps: Nicholas is now doing research as to whether the moss discovered by park ranger Moises Daniel Perez Diaz can be used to produce a dye colorant and/or mordant. The moss (same species) came in green, orange, and reddish color (the color changed every few meters in a remarkable bog ecosystem that Nicholas found via an aerial photograph and then hiked with the team many hours to study what plants were present). When you look at aerial photos of Parque Nacional Yaxha Nakum Naranjo (or Google maps in satellite view) you notice a unique single rectangular area with zero tree forest. Since every aguada, bajo, or savanna ecosystem in the same park (and in adjacent Tikal national park and in all parks to the east in Belize) are oval or irregular shape, to find a pure rectangle documents it’s “Made by the Maya” (several thousand years ago). So I was curious about what plants we would find here, so last week we spent several hours out in the Mayan rain forest hiking around the southeast side and southeast corner around to the east side. All forest trees stop at the edge of this Poza Maya or Aguada Maya, as it is named. But inside the rectangle the soil is moist (since the ancient Maya put a layer of material to keep the water from escaping). Growing in this bog-like eco-system is a thick entanglement of tall plants whose fronds remained me of palm trees but when Elena Siekavizza reached these plants she recognized they were giant ferns. Once she got back to our main research office she identified them as Acrostichum danaeifolium. We also found edible begonias in the bog. Most of these plants have not been registered as being present in Parque Nacional Yaxha Nakum Naranjo. The giant “tree fern” is totally different than ones everywhere in the cloud forest of Alta Verapaz. So if you like rare and photogenic plants, plan a trip to the Yaxha national park. Restaurante El Portal de Yaxha (aldea of La Maquina, at crossroads of main paved highway to turnoff towards Yaxha park) offers 4WD service to reach Poza Maya (if booked far in advance). Ecolodge El Sombrero provides comfortable hotel at entrance to Yaxha park. Dr Nicholas Hellmuth has been accomplishing research on waterbirds in 4th-9th century Mayan murals, sculptured stelae, and painted or incised ceramics for 40 years. We now have exhibit quality high-resolution photographs on the waterbirds of Lake Yaxha, between the Mayan ruins of Topoxte Island and Yaxha. So for any bird-watching organization, we have a great visual experience for you. We have 300mm lens for the Canon and 200mm, 400mm, 600mm, and 800mm prime Nikon (Nikkor) lenses for bird photography, plus of course Gitzo tripods, Wimberley Gimbals, etc. to facilitate capturing nice photographs of these birds of the Mayan world. So for any university, natural history museum, zoological park, bird watching organization, or any social club, we have photos to provide a Mayan experience to your conference, class, seminar, lecture, or other event. Would you or your botanical garden like a presentation on AQUATIC orchids of the Mayan lakes of Guatemala? If you would like a lecture on aquatic orchids (that Dr Hellmuth discovered in Lake Yaxha, Peten, Guatemala) we now have high-resolution photographs of Dr Nicholas Hellmuth out in the remote lakes documenting the fact that these orchids have their roots at water level (and frequently down into the water of the lake). These orchids are not growing from seeds fallen from the shore. These orchids grow on reeds several meters away from the shore (over the water). If you would like a lecture on dye colorants (for Mayan weaving), or on what foods the Classic Maya could harvest from the surrounding rain forests (with no slash-and-burn milpa agriculture), and especially if you would like to know what SuperFoods the Maya had available for thousands of years (more than just maize, beans, and squash), he can lecture in Spanish, German, and English, or can be simultaneously translated into your local language. And also consider visiting Parque Nacional Yaxha Nakum Naranjo in Guatemala, to see these aquatic orchids in full bloom (plus of course all the other orchids: terrestrial and arboreal). 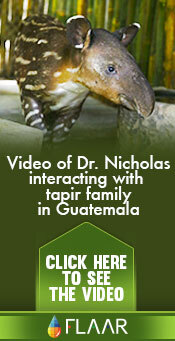 Dr Nicholas (as is his nickname around the world) has been in Mexico, Guatemala, Honduras, and Belize since age 16. So he is familiar with Mayan archaeology, art, iconography, plus the plants of the rain forests surrounding the ancient Mayan cities. More than 70% of the trees in Parque Nacional Yaxha Nakum Naranjo have white lichen on their trunks (most jiote and most pimienta gorda trees escape lichen). 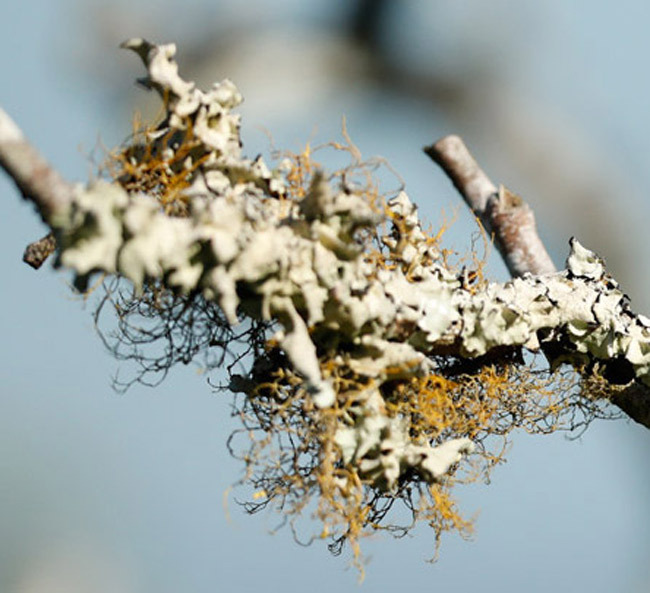 There is rose-colored, orange, pink, reddish, light green and a few other colors of thin lichen on tree trunks (but white is over 70%, in some areas over 90%). We are looking for 3-dimensional lichen. 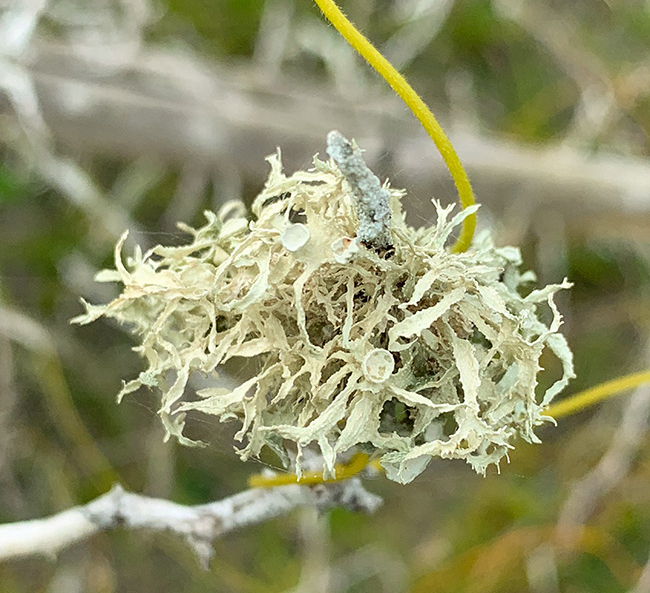 Maria Alejandra Gutierrez, FLAAR Mesoamerica, found and photographed this lichen on the road between Yaxha and Nakum in mid-January 2019. Camera Canon EOS-1D Xmark II, lens Canon EF 300mm f/2.8L IS II USM; settings: f/2.8, speed 1/8000, ISO 1000. We will try to find this branch the next time we are in the 17 km stretch between Yaxha and Nakum. Perhaps the crusty whitish lichen is curling up because the branch is no longer alive. I say this because over 90% of the lichen on millions of trees in the park is normally flat when on a growing tree trunk. Lichen is a different shape along the shores of Lake Yaxha on dead branches over the water (where the lake has risen and frees formerly on the old dry shore are now dead because the lake level has risen). However the lake shore lichen shape is because the branches are water soaked plus are one to two meters above the water level (the lower trunks are in one to two meters of risen lake level). Since we do not have a PhD in lichen or mushrooms, I am not able to identify the thin red spaghetti under the white lichen (in the photograph at the left). But it is rare to find spaghetti-like lichen or mushrooms in the park. Red Cuscuta parasitic vines are common, but this is not Cuscuta. Perhaps the thin orange spaghetti growth is either lichen or moss or some other growth. We will work at finding more of this and photographing it with better focus next time. The Italian pasta-like material in the photograph at the left has a Cuscuta vine going under and around it. Cuscuta is “everywhere” along the shores of Lake Yaxha and in dry areas between Yaxha and Nakum. But I photographed this Italian pasta mass because it looks to me more like 3-dimensional lichen than the thin orange spaghetti in the photo at the left. I am interested in finding and photographing all 3-dimensional lichens since these are more likely to be a source of colorants. The Aztec and their neighbors used both mushrooms and lichen for colorants. The Maya had mushrooms available and we have found the colorant mushroom all over Yaxha and Nakum and in between. But we have not yet found lichen, nor have we yet found good photo albums and checklists of lichens of Peten. For Tikal there is a thesis on mushrooms of Tikal. Would help to have a thesis or dissertation on lichens of Parque Nacional Yaxha Nakum Naranjo. Panorama photography equipment options for national parks: reviews & recommendations; and also tips of what to avoid. The beauty and attractiveness of this large national park is much more than archaeological remains of pyramids, temples, palaces, ballcourts, acropolises, plazas, causeways (Sacbe), etc. Lots of plants out there. Lots of Mayan pyramids buried under these trees and vines. But just imagine how many awesome tropical flowers you can find during the season these trees flower (March, April, May and many other months). Botanist Cyrus Lundell estimated there were 2,000 plants in the central Peten rain forests. 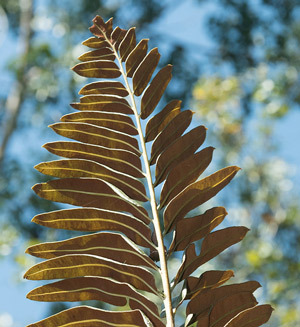 Other botanists suggest there are over 200 species of trees. The other 1800 plants are vines, orchids, bromeliads, and plants of the shores, marshes, and bogs. So there is huge potential for botanical research at Parque Nacional Yaxha Nakum Naranjo. In the 1970’s I spent five years doing the map of all the monumental architecture plus the smaller house mounds. But today (2018-2019) I come to Yaxha to study the neo-tropical flora and fauna of this park. In the long run it will be essential to do aerial photography, preferably with a helicopter, since here you can use high-resolution cameras. Drones will pester local birds and 90% of the cameras on drones are simple point-and-shoot and overly wide-angle: cameras for bikers and hikers on their weekend and vacation adventures. We prefer serious photography, so we use a Nikon D5 and a Canon EOS 1DX Mark II camera. But until we find a helpful individual or company with a helicopter who can donate photo opportunities, we show the remarkable rain forest with panoramas taken from the top of pyramids and acropolises at Yaxha and Nakum. We hope to get back to Naranjo and do panoramic photograph there with archaeologists Vilma Fialko, Raul Noriega and their capable team. We have L-shaped panorama tripod heads (Bogen 3288 (Manfrotto 340)). We have the second-generation GigaPan, the most awesome panorama camera yet invented. Plus already in the 1990’s we had the BetterLight tri-linear scanner large-format digital panoramic camera system. At Photokina 2016 we spent quality time in the NOVOFLEX booth; they have a diverse range of L-shaped panorama equipment with quality Made in Germany. But until their equipment is available to evaluate, we will be writing about the L-shaped Bogen 3288 (Manfrotto 340) on a Manfrotto 303PLUS panoramic photography head system and the GigaPan panorama photography systems. We close this peek into the rain forests of Parque Nacional Yaxha Nakum Naranjo with another panorama by the FLAAR Mesoamerica photography team. All these photos are to show the world the natural beauty that you can experience here. The hotel Ecolodge El Sombrero has many of the same trees over the hotel restaurant and directly in front of your hotel room. This hotel is at the entrance to the park, to the left directly at the entrance gates.